What does this mean to the artist’s studio practice? The artist studio has traditionally been a finite space, defined by its physical walls, flat file cabinets, table surfaces, portfolio cases, and print racks. While you might consider the en plein air or Sunday painters as the exception to the rule, with their field easels overlooking outdoor landscapes, the studio of Now – a networked personal computer catalyzing an instantaneous flow of information – extends the studio well beyond landscapes and ocean vistas into the ever-expanding realm of cyberspace. The artist now incorporates tele-communications, social media, digital storage capacities, cloud-based file directories, and virtual desktop space with room to move and roam beyond the physical world: opening up new potentialities for collaborative research and peer-to-peer artistic production amplified by the network. In thinking about the ramifications of the dramatically changing studio, I have formulated a set of paradigms, methodologies and aspirations over the past four years that has taken shape as the Open Source Studio[ii] (OSS) project. OSS grew from the need to completely rethink an approach to teaching studio-based media art informed by the potential of global communications. The OSS project began as an artist residency in 2012 when I was invited to create an online graduate course for the Integrated Media Center at the California Institute of the Arts. The challenge was clear: how to engage art students of all disciplines in an immersive online experience that encourages collaboration and transparency while teaching remotely from my studio in Washington, DC. By this time, I had already reconfigured my own studio as a space for Internet performance art with the production of The Post Reality Show[iii], an Internet talk show and online multimedia artwork. 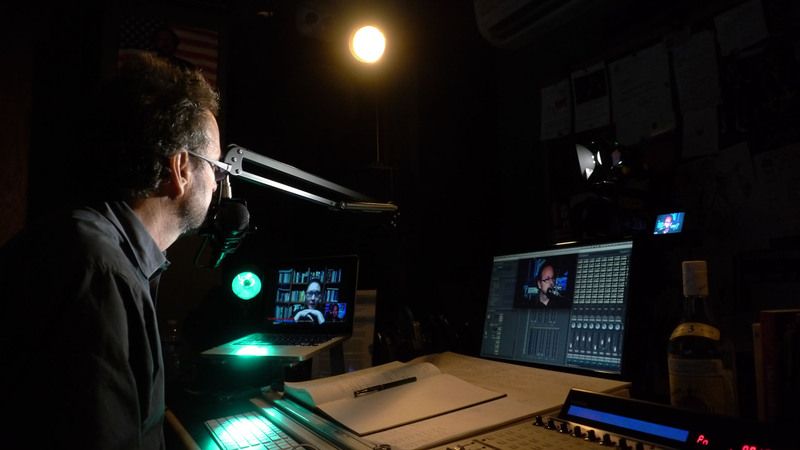 As a long time educator who considers standing in front of a class an act of performance, it was a natural progression to consider the studio as a stage for remote teaching. 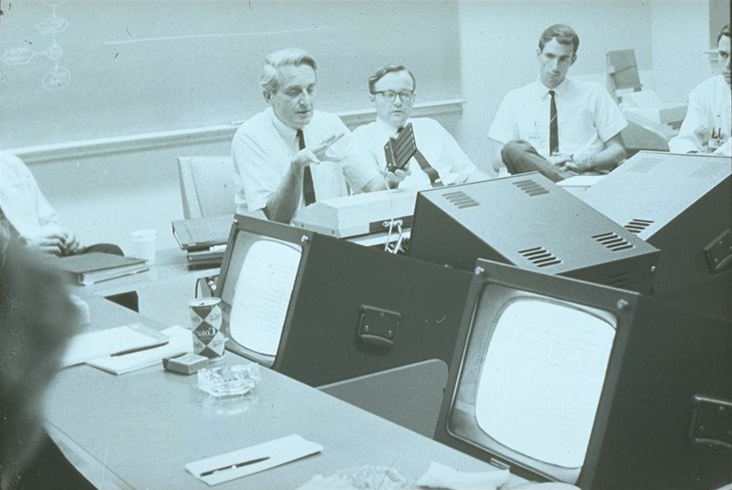 CalArts was the ideal venue to formulate OSS, an institution that is renowned for encouraging a culture of experimentation and expanding the boundaries of discipline and media. The central concept of the course was to provide CalArts students, all of whom were in residence at the Institute, a visceral experience of the virtual, that is, an immersion in Internet art and culture through study in the medium itself. Students from the various disciplines at CalArts (music, art, dance, theater, and film) were engaged in weekly, live web-conferencing sessions via Adobe Connect, a medium for hosting online lectures, discussion, and chat. These sessions focused on topics ranging from the history of networked art to issues of privacy, surveillance, distributed presence, and virtual identity. The course also exposed students to open source thinking in order to inspire and inform collective processes of learning, research, documentation, and artistic production. We created a WordPress site that served as an integrated virtual studio environment for students to post and share their writing and research, document their projects, engage in online discussion, and participate in social media feeds. In 2013, I joined the faculty of the School of Art, Design & Media (ADM) at Nanyang Technological University in Singapore, where the OSS project underwent a 2nd generation of conceptualization and development. In 2014, we designed a new WordPress environment that invited students to work across a “suite” of virtual studios, known as a “multi-site,” each student with their own personal Website united by a single database. This configuration enabled highly sophisticated aggregation schemes to organize student work within a single class Website that dynamically integrated the research and artistic work of each student and encouraged the cross-pollination of ideas and process. This essay is intended to detail the conceptual framework behind the Open Source Studio project: a philosophical, pedagogical, and aesthetic position on open source thinking that suggests how creative artists and professionals from all disciplines might recalibrate their relationship with the network to expand their practice in order to “do it with others.” In an increasingly connected telematic culture, the romantic notion of the solitary artist sequestered in a lonely atelier, perhaps escaping momentarily to capture a landscape, may truly be a thing of the past. I invite you to consider the possibilities. The key to understanding how we have evolved a networked studio practice can be derived from historical precedents in both art and technology, in which a radical embrace of integrated, socially engaged modes of collaboration and information exchange has transformed the way in which we work and communicate today. An important concept is the evolution of the gesamtkunstwerk (total art work), found in 20th century avant-garde movements of art and design, such as Futurism, Surrealism, The Bauhaus, Constructivism, Fluxus, etc. Each explored in varying ways the synthesis of the arts, in which an artistic construction and its materials were considered as a wholistic or interconnected form of expression. Allan Kaprow, a member of the Fluxus art collective based in New York City during the 1960s, was deeply influenced by the gesamtkunstwerk, pioneering seminal works of performance art he coined as Happenings, which integrated any and all forms of media, action, gesture, spoken word and artifacts. In his seminal essay, “Untitled Guidelines for Happenings[i],” Kaprow described the Happening as an event that might take place over an extended period of time, distributed across a vast distance, occur in multiple locations simultaneously, and incorporate viewer involvement: a blurring of past and present, local and remote, audience and performer. In Kaprow’s Happenings, the artist would often introduce the audience member as an active agent in a networked, participatory, social exchange of scripted actions. This decentralization of authorship, location, and narrative foreshadows the non-hierarchical and non-sequential forms of interactive and networked media that expand and realign the boundaries of time, space, viewer and artist to create new kinds of collective experience and social engagement. In his work at the Stanford Research Center, he brought together a team of scientists to share information across a local area network, the first experimentation of its kind with the potential of synthesizing intellectual processes of thinking and learning via interconnected computers. Alan Kay led his research team of scientists in the 1970s at Xerox PARC (Palo Alto Research Center) in the creation of the first personal computer running a graphical user interface (GUI). Kay referred to his SmallTalk system – later appropriated by Steve Jobs for the Macintosh OS – as a metamedium:[iii] an integrated environment of graphics, animation, sound, and networking that could be thought of as the digital equivalent of the gesamtkunstwerk. The metamedium, or “medium of mediums,” developed in tandem with children to test the intuitive processes of learning and creating with computers, was intended to make computing accessible to artists, designers, scholars, educators, etc., not just engineers, leading to the explosive surge of interactive multimedia in the 1980s and 90s. The way of open source is a passionate ideological stance that many technologists and artists have taken as a challenge to hierarchical, profit-driven modes of production and distribution. The history of computing and telecommunications provides insight into the value of open source philosophy: from large government-military projects such as ARPANET that freely shared its knowledge with the research community leading to the creation of the Internet and the personal computer; to small renegade organizations such as the Homebrew Club in Palo Alto, where the Apple Computer was born in the mid-1970s amidst the hacker and computer hobbyist community; or the World Wide Web[v], created in 1989 in Tim Berners-Lee’s lab at the CERN research center in Switzerland, which to this day remains a classic model of open source development and community sharing. 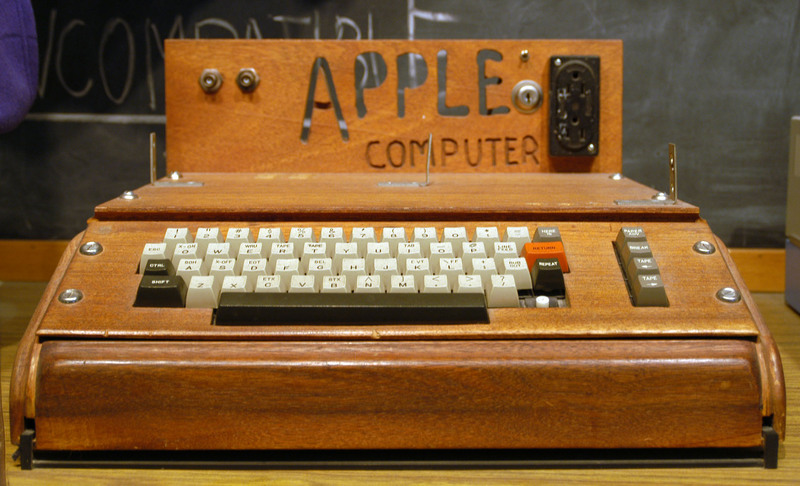 But in the mid-1970s, a dramatic shift occurred when Steve Jobs convinced Apple I engineer Steve Wozniak that he could turn his hobbyist machine into a product; or when Bill Gates created the first operating system for the do-it-yourself Altair 8800 personal computer kit designed as an open system, and created an empire built on the commodification of software: Microsoft. These acts of entrepreneurial ambition served as a tectonic transition from computing as open source hacker / hobby activity to a multi-billion dollar technology industry. Since then, open source activists have been continuously challenging the corporate establishment. The hackers have been preaching openness and collaboration in a world dominated by elite control of patents, copyrights, and proprietary ownership. These renegades include Richard Stallman, who launched the Free Software Foundation[vi] in the 1980s in an effort to fight for software rights to protect hackers and open source devotees. Despite the marginalization of the open source community, they have produced software and hardware used by millions, including: the Linux operating system, Wikipedia, Mozilla Firefox browser, and the WordPress content management system. Many of these projects, which began as alternatives to commercial products, have become dominant, due to the power of open source ideology to stimulate innovation and creativity. The open source way may be viewed as a quasi-utopian form of peer production that inspires transparency, collaboration, collective processes, non-proprietary methods of production and distribution, and a commitment to the creative process as a social exchange: not necessarily for profit, but for the common good. Open source promotes the free distribution of goods and services, it has an aspirational intent to better the world, or mankind, or a particular field of study, and embraces socialist ideologies of economic and political equality. As an artistic stance, open source thinking has served as a way to challenge the prevailing status quo, such as the profit-driven market system of commercial galleries and art fairs. Many artists will only show their work in alternative art spaces that serve as resistance to the commodification of artistic production, and which support more ephemeral forms such as conceptual art, media installation, and performance. Open source is a way of life and a philosophical commitment to breaking down existing hierarchies, promoting openness and fairness, encouraging experimentation, and insuring the freest and broadest possible distribution of knowledge, intellectual, and creative resources. Artists have historically challenged systems of hierarchy and control by using “open source” techniques to freely borrow from mass media and popular culture, creating artworks that appropriate material from newspapers, magazines, film, radio, television, and the Internet. These artists have sometimes taken a politically rebellious stance by resisting the dominant culture through free appropriation, sharing, and distribution in defiance of copyright restrictions. The history of appropriation is long and varied, resulting in works of collage, remix, détournement (hijacking), sampling, hacking, and other uncategorizable techniques by 20th century avant-garde movements. For example, Robert Rauschenberg’s epic construction, Retroactive I[i], is one of the classic mixed-media collage works from the 1960s. Rauschenberg used news images of President Kennedy and the space mission by employing the silkscreen process to overlay appropriated newsprint with painting and drawing. More recently, the Web has provided artists an immediate and accessible platform for the appropriation of online materials. 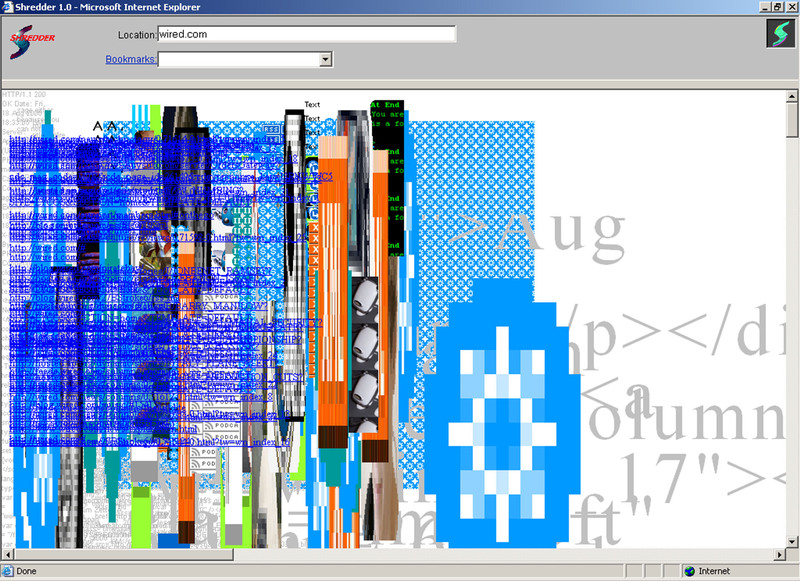 In Mark Napier’s The Shredder[iv] from 1997, the artist designed a custom browser that deconstructs or “shreds” Websites, providing the viewer the means to appropriate and generate their own collaged abstraction using the Web as a vast open source repository. The artist has essentially created a tool that resituates the viewer as the protagonist for real-time appropriation. Artists also use open source sharing to make research available through their Websites and blogs. Artists sites by Jon Cates, Mark Amerika, as well as my own Reportage from the Aesthetic Edge[vii], provide a window that gives open access to the studio and artistic process. These sites use networked space as an arena for experimentation, such as in the fragmented utterances of Cates’ GL1TCH.US[viii]; or Mark Amerika’s Professor VJ[ix], in which the artists are spontaneously testing ideas through experimental writing. These artworks and projects of open appropriation and online research point to an open source artistic practice that is deeply committed to sharing and collaboration. Using a rich field of connections afforded by relating one’s work instantaneously to the public via hyperlinks, metadata, social media, repositories, etc., the artist is creating works and systems of interaction with the viewer that constitute an open source space that exposes the artistic process by inviting inclusivity and participation. Narrativity takes on new meaning and form in networked practices, through collaborative, many-to-many systems of writing, media-making, and other forms of online expression. In connection with open source thinking, the collective narrative is a sharing and open exchange of conversation, ideas, information, and media that leads to a synthesis of voices: forming a common thread among peers. Collective narrative can also be traced back to 20th century avant-garde movements in which social interaction was integral to the invention of new forms of artistic expression. One of the best known examples would be the Surrealist game: exquisite corpse (exquisite cadaver), in which a group of artists would compose words or images collectively using pre-determined rules to construct a composited work that is the summation of each artist’s individual contribution. The Happenings and performance art of the 1960s, a seminal emergence of audience participation, provides another model for the collective narrative. Performance artists including Allan Kaprow and Yoko Ono created participatory works according to rules or guidelines. In Cut Piece[i] (1964), Ono required that audience members take a scissors to the artist’s clothing until she was stripped bare, a radical critique of the role and treatment of women in society in which collective audience interaction produces a powerful narrative of control, invasion, and exposure. Works such as Cut Piece precede later examples of networked media art that involve not only audience participation, but many-to-many interaction between viewers. 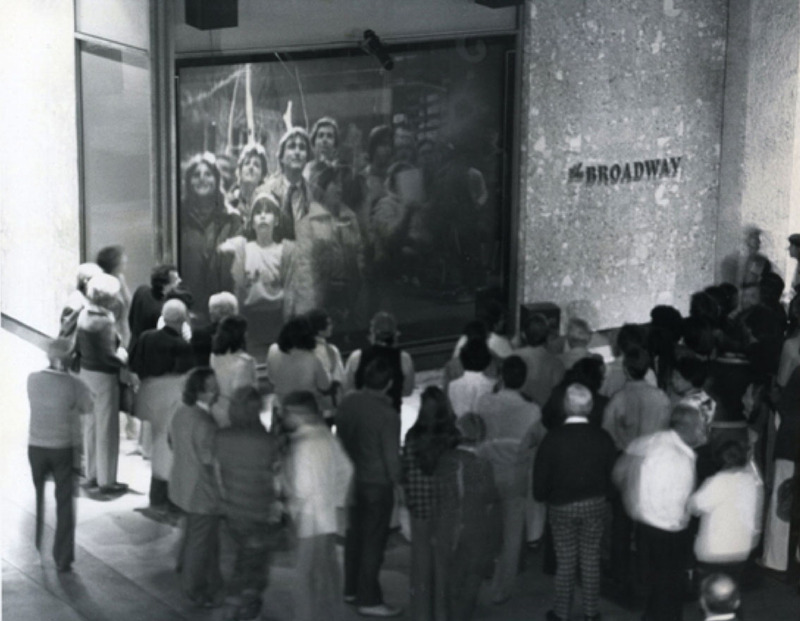 One of the most significant early works from the 1980s was Kit Galloway & Sherrie Rabinowitz‘ “Hole in Space [ii].” This telematic artwork incorporated viewer participation by connecting audience members via satellite linkup between New York and Los Angeles, distributing the work over a 3000-mile distance. Participants engaged one another in spontaneous interactions, charades, conversation, and even proposals of marriage. This form of social engagement through the collapse of the local and remote into a networked space or “third space[iii],” can be traced back to Allan Kaprow’s notions of the Happening encouraging simultaneous actions in remote locations, an idea now prevalent in live telecommunications. In the 1990s, the World Wide Web advanced the many-to-many paradigm of multi-user interaction much further, in which there were new, previously unimaginable opportunities for collective narrative. One of the seminal examples would be Douglas Davis’ 1994 “World’s Longest Collaborative Sentence[iv],” an open source invitation to an online audience to collectively author a single run-on sentence in the telematic writing space of the Web, just one year after the medium’s public launch. Another work by Jenny Holzer, the 1997 “Please Change Beliefs[v],” invites viewers to remix the artist’s well-known “truisms,” aphoristic commentary on society and politics. By asking a worldwide audience to edit truisms stored in an online database, the work suggests that there is no longer such thing as a singular interpretation of truth in the age of the global network. In the 2000s, with the emergence of blogging and social media, the idea of collective narrative has become nearly ubiquitous. The advent of database technologies such as the metadata of hashtags has catalyzed collective utterances with a speed and urgency that is now known as “trending.” Such platforms as Twitter, an entirely public telematic writing space, has encouraged collective forms of narrative on a mass scale. While this may not be thought of as traditional narrative, social media sharing and asynchronous dialogue constitutes a form of narrative that is compressed, often playful, and multi-threaded. There is clearly a connection between the early forms of spontaneous invention found in the work of Douglas Davis, for example, and the collectively-inspired free-form exchanges that take place in Twitter or Facebook. The possibilities of peer-to-peer authoring of the collective narrative is now native to our writing tools, such as Google Docs, Microsoft Word, and WordPress, in which multiple authors can co-author and collaborate on writing projects, often in real-time. This dramatically alters the act of writing and narrative, from the singular activity of a very personal form of individual expression, to a collective activity that is highly collaborative: all publishable instantaneously to a global audience. [iii] According to the author’s own theoretical observation, the first space is the physical world, second space the representational, such as a painting or photograph, and the third space is a shared, networked environment. The concept of the open source studio finds its greatest potential in the collaborative practices among peer groups that share goals, methods, ideologies, and aspirations. When artists and other creative practitioners aggregate their work (do it with others), it constitutes a form of cultural production that is collective in nature, whether it be a work of art, creative dialogue, or social interaction with the public. The Internet and social media have catalyzed this capability by providing multiple distribution channels for discourse and shared production. In this concluding section, I will provide a recent example from The NetArtizens Project[i], created in collaboration with Furtherfield[ii], an alternative arts organization based in London co-directed by Marc Garrett & Ruth Catlow. Furtherfield, like many contemporary arts organizations, embraces the social practice of peer-to-peer cultural production as fundamental to its programming and relationship with its audience. This constitutes an organizational approach to open source practice, which like the open source technologies cited earlier, exist outside of the market-based system: an alternative to prevailing commodity-driven models found in the art world. What is most essential about peer production is the way it exploits human capital as opposed to monetary capital, the latter being an issue that plagues the artworld today with its emphasis on art as high value investment. With Furtherfield, as well as other alternative arts organizations that include the Eyebeam Center for Art & Technology[iii] in Brooklyn and the V2_Institute for the Unstable Media[iv] in Rotterdam, just to name a few, programming often takes collaborative forms such as DIY (do it yourself) events, hackathons, maker-fairs, residencies, and other activities that involve artists and/or technologists facilitating workshops. These events are designed to engage the public in the creation of artworks, science projects, book-making, hardware, wearables, and social computing in the context of public participation. As part of the Art of the Networked Practice | Online Symposium[v] organized at Nanyang Technological University, I invited Furtherfield and its worldwide artist community to explore and discuss networked art practices. 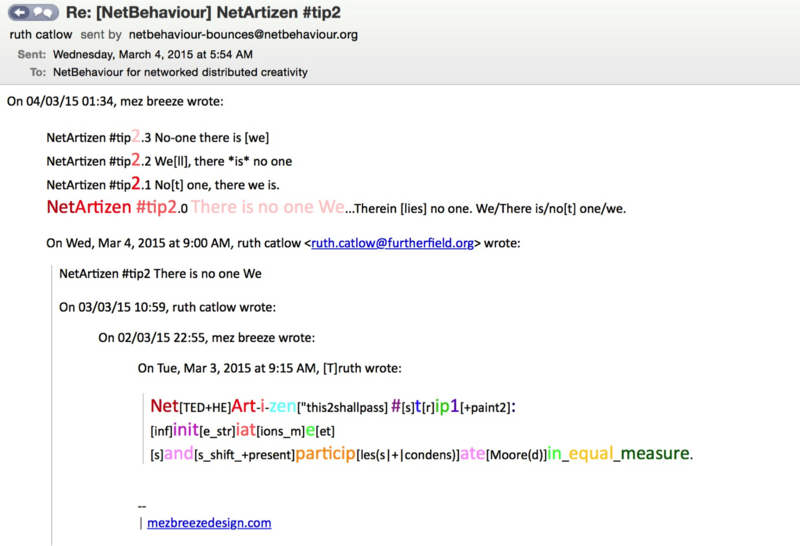 This resulted in The NetArtizens Project, a social experiment conducted across three network channels: Furtherfield’s NetBehaviours Mailing List[vi], Twitter @NetArtizens[vii], and the 0P3NR3P0.net[viii] open database repository for media art. Over 200 artists participated in the project, a peer collaboration involving exchanges of wordplay, critical discourse, collective art, and a group organized show entitled: NetArtizens Open Online Exhibition. The NetArtizens Project was not curated, nor were there gatekeepers or filters, rather, it was an invitation for artists to participate freely and openly to collectively produce what the information pioneer Vannevar Bush referred to as a “cultural record.”[ix] The event produced a record or archive of discussion and artworks commenting on Internet related issues, concepts, and behaviors. The NetArtizens Project revealed artistically what open source practices produce in the form of tools: non-proprietary, non-hierarchical, collectively-driven contributions to a public repository: in this case, a cultural record documenting and critiquing the art of the networked practice. In reviewing the histories of artists and technologists engaged in open source ways of working and thinking in the digital age – despite the corporate influence of technology companies, social media and big data – it appears there is a compelling path towards open, non-hierarchical approaches to peer-to-peer cultural production. This is evident with the surge of independent journalists, bloggers, mailing list communities, and Internet broadcasters who tag, disseminate, and share their unfiltered communications throughout the network. Perhaps the idea of netizens (or netartizens) constitutes the greatest manifestation of the open source studio, in which we are all potentially co-collaborators in the global information culture.